NEW YORK, December 3, 2018, /3BL Media/ – CECP: The CEO Force for Good today published a new white paper exploring how companies are integrating diversity and inclusion (D&I) into their corporate citizenship and responsibility priorities, Diversity & Inclusion in Corporate Social Engagement. With support from the Walmart Foundation, CECP led this year-long inquiry with the goal of identifying and sharing actionable insights and best practices that corporate leaders can learn from and apply in their own companies. CECP is a coalition of more than 200 companies and CEOs that believes that a company’s social strategy--how it engages with key stakeholders including employees, communities, investors, and customers--determines company success. 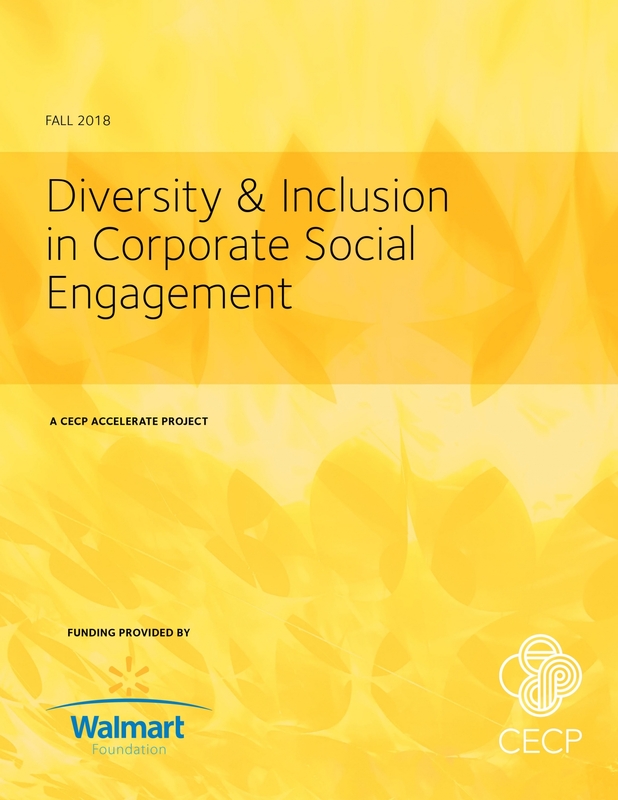 CECP surveyed 58 corporate social engagement (CSE) professionals from 52 companies and interviewed corporate practitioners from 14 companies, all representing a wide range of industries. In-depth interviews were also conducted with five subject matter experts. In addition, CECP conducted secondary research of current D&I literature from more than 50 sources representing corporate and foundation engagement in D&I, including analyzing CSR reports from Diversity Inc. Top 50 Companies and reviewing foundation publications and research. With the help of the learnings from the white paper, CECP seeks to equip CSE professionals with the latest knowledge and methods to advance their organization’s CSE efforts to address issues of D&I; help accelerate D&I efforts via CSE strategy and the success of the field; and provide case studies that offer inspiration and valuable insights to practitioners embarking on this work. The White Paper lays out six key trends, accompanied by in-practice guides, case studies, and recommendations for areas of future focus as companies integrate D&I into their CSE work. Developing a strategic, integrated approach across all business functions to CSE D&I is the biggest challenge — and opportunity. Employees — at all levels — have a critical role in advancing D&I efforts in CSE. Developing a clear and strategic approach to addressing equity in CSE is challenging on multiple fronts. There is a need to improve the measurement of D&I in CSE. Building D&I understanding within the company. Linking D&I with key internal stakeholders, such as HR, CSE, and Employee Resource Groups (ERGs). Assessing current grant-making practices to assess current integration with D&I. Identifying priority areas for focused development and progress. In addition to the white paper, CECP launched an Accelerate Community focused on advancing D&I through CSE. Participants in the Accelerate Community joined this corporate peer-learning cohort to further explore the key issues uncovered in this report through collaboration, sharing best practices, and identifying strategies and programs that leverage CSE to progress D&I. On November 19, more than 20 HR and D&I professionals from companies in this Accelerate Community representing a wide range of industries, from consumer goods to financial services to the energy sector came together to discuss opportunities and challenges within their organization to advance diversity and inclusion, both internally and externally. The community will engage in a year-long dialogue with the goal of publicly delivering Guiding Principles to provide companies with not only guidance on policy but also actionable programs, trainings, and expert resources to advance D&I within their companies. The paper is available to download for free from CECP’s website. Email CECP to learn more about the D&I Accelerate Community.